How saying "no" to spending can save you money. You’d be surprised at how much cash you can save with just that one word. 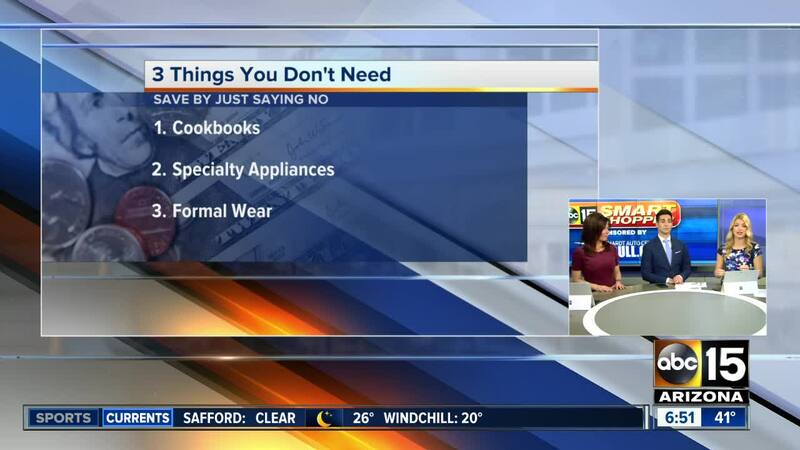 So here are some things that you just don’t need, and avoiding them can really save your bank account. I'm guilty of buying cookbooks as gifts. If you're budgeting, A better solution is to use one of the thousands of free recipes posted online. I use allrecipes.com a lot. Also on the list, small specialty appliances that perform just one task. Example of a solution: replace your toaster with a toaster oven - multiple uses! Yes, dressing up can be fun. But how often do you do it? Try renting things like tuxedos, and and if you decide to buy it, get some of your money back by selling it. Rather than paying extra to make trash smell good, add essential oils or dryer sheets to the bottom of the bag. You can also simply use a smaller trash can. The more you take the garbage out, the less it should smell. Are you still buying rags? Just say no! Instead, use old t-shirts, cloth napkins, anything else you have lying around that would most likely end up in the trash, or simply clutter your home. If you don’t like tap water, buy jugs over bottles. It’ll save cash and it’s better for the environment. There are also so many trendy re-usable water bottles out there that are better for the environment and your wallet. And if you happen to buy a case of water bottles, re-use those as well. Magazines are an easy distraction at retail stores. You get drawn in since they are often located right by the registers. Don’t get sucked in! If you enjoy magazines, you’ll do better by opting for a subscription. Most times, you’ll save more than half. Buying pre-portioned produce is definitely convenience, but also drains your wallet. But you’re definitely paying for the convenience. Make the time to create your own pre-portioned produce. Placing them in plastic bags? Re-use your baggies to save money and, again, the environment. Do you have other money-saving ideas? Email me at SmartShopper@abc15.com .